When my wife and I were introduced to Reformed Christianity, one of the things that stood out vividly to us was the practice of family prayer or "family worship." In the revivalist, evangelical church in which I grew up, this practice was never emphasized. To be sure, the church in which I was raised encouraged important devotional acts such as praying and reading one's Bible, but I can't ever remember a pastor emphasizing the necessity and importance of regular family worship during the week. Instead, there was a full array of programs and small groups offered, each tailor-made to every member of the family: Jr.High group, high school group, college-and-career, men's group, ladies' group, young marrieds, married-with-children, empty-nesters, etc., etc. Not that everything in all of these groups was always bad. It's just that there seemed to be an emphasis upon separating the family as a unit during the week in order to "minister" to each person's needs. Oddly enough, Sunday worship wasn't much different. My family would arrive at church only to split up into our segregated groups for worship: I, a "youth pastor," would go to the high school "worship service," while my wife went into the main service with the adults, and my daughters went to "children's' church" with the toddlers. The first time we worshiped together as a family was the first Sunday we visited a confessional, Reformed church (!). Deut 6.4-9: Hear, O Israel: The LORD our God, the LORD is one. You shall love the LORD your God with all your heart and with all your soul and with all your might. And these words that I command you today shall be on your heart. You shall teach them diligently to your children, and shall talk of them when you sit in your house, and when you walk by the way, and when you lie down, and when you rise. You shall bind them as a sign on your hand, and they shall be as frontlets between your eyes. You shall write them on the doorposts of your house and on your gates. Passages such as these, however, cannot be reduced to mere proof-texts for sending our children to Christian schools or buying Christian home-school curriculum. They require of us something far more vital than that. In the first place, they require the indispensable practice of the “family pew,” that is, a commitment of bringing our children to corporate worship every week. In worship, our children - no less than us - are summoned by God to receive his good gifts, confess their sins, and bring him praise and honor as the Creator and Redeemer of his people. But these commands also require a commitment to daily catechesis so that our children will know what they believe and why they believe it. This is precisely why the sixteenth-century Protestant Reformers, as well as the seventeenth-century Puritans who followed them, wrote rich catechisms and strongly advocated the practice of family worship. They understood each family to be a ‘little church,’ in which the father was called to be priest and spiritual head of his home under Christ. It is for this reason that the Westminster Confession of Faith teaches that worship is to be conducted “in private families daily” (21.6). This was taken so seriously by our fathers in the faith, that the General Assembly of the Church of Scotland not only included in its editions of the Westminster Standards a "Directory for Family Worship," but even mandated disciplinary action against heads of households who neglected “this necessary duty"! What the liturgy of the hours was for monks of the Middle Ages, the discipline of family prayer was for the Puritans. The typical Puritan home of seventeenth-century England may not have looked much like the splendid cloisters of Cluny, but there was something in common. The daily life of both Catholic monk and Puritan family man was ordered by a rhythm of prayer and praise. With Cistercian solemnity, the Puritan household would gather around the dinner table, father, mother, children, a maiden aunt, perhaps servants or an apprentice. A metrical psalm was sung. Then the head of the house would open up a great leather bound family Bible and read a chapter. This finished, the father would lead in prayer. The Puritans, whether on the Connecticut frontier or in the heart of London, whether they were Cambridge scholars or Shropshire cotters, gave great importance to maintaining a daily discipline of family prayer. So what happened in the church that we have lost this vital practice? Why have we forgotten the wisdom of these ancient paths? As with most questions in historical theology, there is not one easy answer. There are several contributing factors that led to the corrosion of this practice. One of them, however, must certainly be the rise of American pragmatism. As Americans, we have an unquenchable thirst for knowing the cash value of something. It may seem to many American Christians that investing in the rigorous daily duty of family worship is too costly. After all, getting a family in 2008 to meet together regularly around a table and take out thirty minutes of the day may seem almost impossible. It would require reordering and restructuring our daily lives. It would require slowing down a little bit. It would require turning off the television a little more (gasp!). If your children are in your home for 18 years, you have [over 5,600] occasions (figuring a 6 day week) for family worship. If you learn a new Psalm or hymn each month, they will be exposed to 216 in those 18 years. If you read a chapter a day, you will complete the Bible 4.5 times in 18 years. Every day they will affirm a creed or recite the law. Every day they will confess their sins and plead for mercy. Every day they will intercede on behalf of others. Think in terms of the long view. What is the cumulative impact of just 15 minutes of this each day, day after day, week after week, month after month, year after year, for 18 years? At the rate of 6 days a week (excluding Sunday), one spends an hour and a half a week in family worship (about the length of a home Bible study), 78 hours a year (about the length of two weekend retreats), and 1,404 hours over the course of 18 years (about the length of eight week-long summer camps). When you establish your priorities, think in terms of the cumulative effect of this upon your children. Think of the cumulative effect of this upon you, after 40 or 60 or 80 years of daily family worship. All this without having to drive anywhere. The family is essentially a discipleship group. In praying and reading the Bible together (and maybe singing too), the whole family is being spiritually nurtured as the truths of the historic Christian faith are pressed before them each day. Parents are humbled as they are constrained to assume the role of priest for their family. They are driven to their knees in a sense of inadequacy of such a task. They are forced to adjust their lifestyle in order to carry out the responsibility of raising their children in the Lord. And they are confronted with the reality of appearing either consistent or inconsistent in the eyes of their little ones. In the meantime, children are growing up watching their parents humble themselves before the Lord. They are learning of Christ’s claim and Lordship on their lives. They are absorbing Scripture and realizing its authority. They are provided with a medium for reinforcing memorization of Scripture, catechism questions, creeds, the Lord’s Prayer, etc. And they are seeing how they are different than the world in that God has set them apart as his own special people. All of this has a great effect on covenant children: it is part of the means God uses to bring them to faith. First, FIND A TIME that works well for your family. For many, this will be the dinner table. Believe it or not, it is actually very simple to transition from eating a meal together (an invaluable and neglected practice in itself) to having family worship without ever leaving the table. On the other hand, maybe bedtime will be more conducive for your family. Whatever the case, just find a time in which everyone in the family is together for at least 15-20 minutes a day. 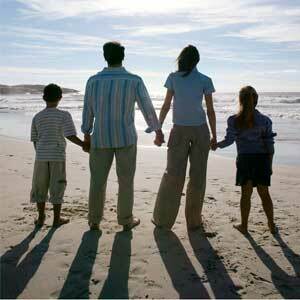 If no such time exists for your family, then you desperately need to make one! Settle on a time that will become as fixed a routine for your family as getting dressed or brushing teeth. Settle on it and guard it! When the phone rings, let the answering machine pick it up. Instead of being enslaved to technology, let it serve you! Second, KEEP IT SIMPLE. There is no reason to make family worship long or complex. You can keep it as simple as these three elements: Scripture reading, catechism and prayer. With regard to Scripture reading, try reading a chapter a day, working your way through particular books of the Bible. Perhaps on certain days, read the passage that was preached in worship the previous Lord’s Day. This will help your family to review what you heard and hopefully develop a practice of meditating on it during the week. For catechism, work on memory with your children. Teach them to memorize the Lord’s Prayer, Ten Commandments and the Apostles’ Creed. Then move on to Heidelberg Catechism Q.1, breaking it down in to parts until they have the whole thing mastered. Move on from there to these essential questions: ##2-5, 21, 27, 60, 65, 69, 75, 86, 116. It will take a while (maybe years), but despite what you might think, they can do it. Be patient. Think long term. Don’t give up. With regard to prayer, teach your children how to pray by modeling it for them. Conclude family worship with the simple acrostic A-C-T-S: adoration of God, confession of sins, thanksgiving for all he has done and given, and supplications for those in need. This is a great opportunity to pull out the bulletin and look at the particular prayer needs in the congregation, teaching our little ones to intercede for others in the household of God. You may also consider singing a Psalm or hymn together before reading Scripture. But whatever the case, family worship should only take about 15 or 20 minutes. Seriously. There is no reason to turn this into a massive ordeal. In fact, fathers, resist the temptation to do that! Once in a while, you may find your family engaged in an extended discussion over a particular doctrine or theological question. It is a beautiful thing when this happens spontaneously and naturally. But don't force it. Ask a few questions, keep it simple, and conclude. If your family comes to expect a forty-five to sixty minute Bible study from dad, they may begin to dread the exercise. Third, GET STARTED! To borrow an old slogan from Nike, “Just do it!” Don’t procrastinate and put it off. Each day your children get a little older. Redeem the time given to you. Fourth, BE CONSISTENT. When you miss a day (or two or three! ), don’t throw in the towel. Get back on track and go. Too much is at stake to give up. Finally, Dad, Mom, BE SUPPORTIVE OF ONE ANOTHER. Satan is against you in this, so be prepared. He wants nothing more than for you to pick at one another during family worship, become frustrated and quit. He wants you to leave the Bible and catechism book on the shelf and reach for the remote at the time you have designated for family worship. He wants wives to be resistant and husbands to be lazy. So, encourage, support and be respectful of one another as you engage in this daily practice. Family worship is a joy, but it takes work. It usually requires some rearranging of our priorities in daily life. And if you are getting a late start with your kids, it will probably be met with some resistance. Pray for one another with regard to your duties in this simple, but awesome practice.